Hypertrophic Cardiomyopathy (HCM) is a genetic condition in which the muscle of the heart is abnormally large. This commonly results in symptoms like, shortness of breath, chest pain, palpitation or fatigue. Patients suffering of HCM have a higher risk for sudden cardiac arrest, even they are young. Although there is no cure for HCM, there are several forms of therapy available to improve the patient’s heart function and relieve the symptoms. One way of therapy is gaining knowledge and understanding about the cause of the problem. For this kind of therapy ANAviewer has been developed in close collaboration with Stanford Health Care. ANAviewer is a computer program that shows the difference between a normal healthy heart and two examples of a heart with HCM, both as MRI data and as a 3D heart model. 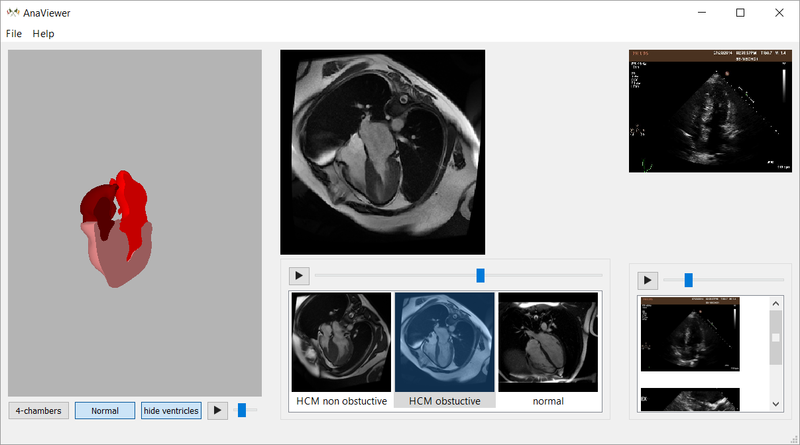 Apart from the hearts that are default available, ANAviewer is also capable of importing echo images or files (DICOM data), for example taken from the patient itself, and show them as a movie, clearly illustrating the cause of the HCM symptoms. ANAviewer is designed for the medical staff to help inform patients that are diagnosed with HCM, to understand the cause of their symptoms. ANAviewer can also be used by patients with HCM to explain their disease to relatives and friends. The ANAviewer program can be downloaded for free from this website and distributed without any restrictions. We hope it will help you to inform others about the effects of HCM.